Face Value: It reflects the story and avoids a headless girl, so 10 points to this cover right off the bat. Plus, I think the bright colors against the black background and the makeup lettering suggest just the right amount of campiness for this title. Does it Break the Slate: Unequivocally. More so, actually, than the first book. In Messy, we have two heroes, Max and Brooke, who both give us really different ways to be a Slatebreaker . Max is our more traditional Slatebreaking character with her quick wit, sarcasm and feminist values. But Brooke, who initially presents as a flaky Hollywood starlet is ultimately painted with a fair amount of depth, and desire to be taken seriously. The surprisingly sincere friendship that develops between the two of them is totally Slatebreaking. Who would we give it to? Readers of the Fug Girls blog, obviously. But most likely they’ve already read it. Messy, and it’s precursor, Spoiled offer up the perfect blend of fluff and substance, tapping into LA culture, blogs, social networking, and a whole host of other contemporary things without ever feeling like an advertisement. Reading the book feels light – it’s not a mentally taxing read, and the pacing moves at kind of a Gilmore Girls fast talking speed. But it isn’t fluffy either – these characters and their story have substance and humor that really holds up beyond just a beach read. If you’re looking for a book to give someone who watches every show on the WB and reads every issue of Us Weekly, this is the perfect book, offering both style and substance. Given that this story is not only a charming, fast paced enjoyable read, but it includes blogging, acting and a ton of Nancy Drew references, it was kind of a lock on this blog, that we’d find it delightful. When I first heard that the Fug Girls were getting into the YA lit game, I was a little skeptical, but awesomely, their snarky, on-point, observational humor translates fantastically to this format. The story is a little predictable of course, but the characters are fantastic and the writing breezes along in a totally likable and engaging way. I actually think the biggest selling point on this book is just how witty and sharp the writing is. It’s deeply immersed in LA’s Hollywood culture in a way that manages to skewer it just gently enough to make the point, but not in a bodysnarking or uncomfortable way. The writers are obviously both a part of this culture and sarcastic outside observers, which gives the book a nice balance. 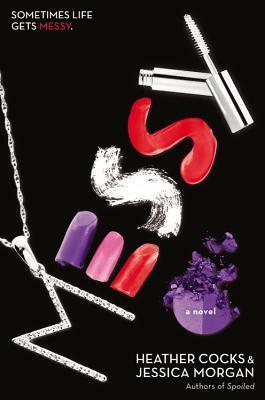 From the snarky repartee between Max and Brooke to the total devastation wrought upon Nancy Drew by the terrible Hollywood adaptation Brooke stars in to the fact that the major love interest, actor Brady Swift, had to change his name for SAG because his first name was…Taylor, this book made me laugh out loud. Also, it would have been really easy for this to be just Max’s story. She’s obviously the character I relate to, and the one that most readers will relate to. Brooke Berlin could have been portrayed as totally vapid and manipulative. But really, she’s not. And Max is not a blameless cynical outsider either. Both girls demonstrate unique, fully realized way to approach being a woman, and they find out that they can learn and benefit from each others’ strengths. Because the thing is – Brooke does have a brain. She’s smart, even if she’s not smart in the same way that Max is. And we really get that sense from the writers. And Max is still interested, to a certain extent, in the Hollywood lifestyle that Brooke espouses, actually having fun writing the blog. They turn out to be legitimate friends. Max surprises herself by defending Brooke. Brooke actually wants to spend time with Max when they aren’t working. From a Slatebreaking perspective, the way these characters ultimately prove the point that there are a lot of ways to be a smart awesome girl, and that girls deserve to be taken seriously regardless of how they approach the world is unabashedly gratifying. It might be a bubblegum fairytale ending – but it’s a satisfying one. This entry was posted in Reviews, Young Adult and tagged Blogs, Fug Girls, Hollywood, LA, Nancy Drew. Bookmark the permalink.